The Christmas Truce in the trenches of the First World War has birthed a variety of dramatic and musical treatments. It has the aura of myth, despite being well documented reality, but too often is romanticised and over-sentimentalised. 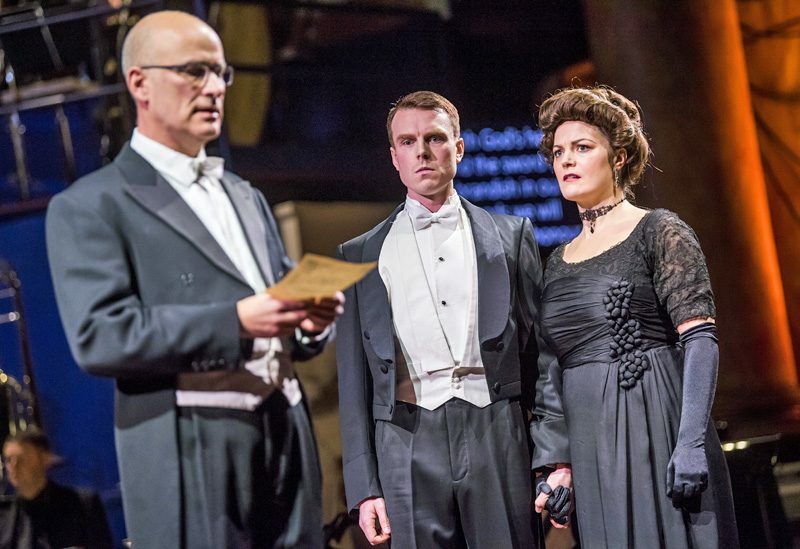 Kevin Puts’ opera, receiving its UK premiere with this Opera North production, makes no such mistakes. It is powerful and moving, not a trite assault on the tear ducts. It conveys the pity and the futility of war, and the precious fragility of peace through the music and the libretto, through the strength of the performances and imaginative use of staging. 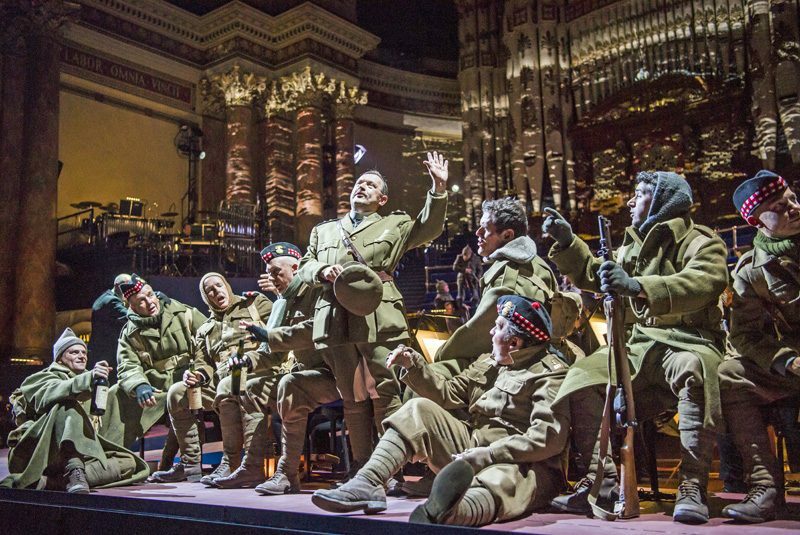 This concert brings soloists to the front of the stage, with small groups of French, Scottish and German soldiers providing a satirical counterpoint to the lead voices. From time to time individuals from each of these three nations move slowly forward and sink, equally slowly, to the ground. Larger groups rest or sleep in the rows behind, as silent footage plays across the space of soldiers marching, going ‘over the top’ and lying in the mud. These images are mirrored and fractured by the imposing structure of the organ pipes. We see just clearly enough for this repetition to give a powerful sense of the numbers of men involved. The music is marvellously eclectic. Percussion-heavy dissonance conveys gun barrages and the chaos of battle, which Puts intersperses with Mozart and the nationalistic songs used by soldiers to psych themselves up for battle. 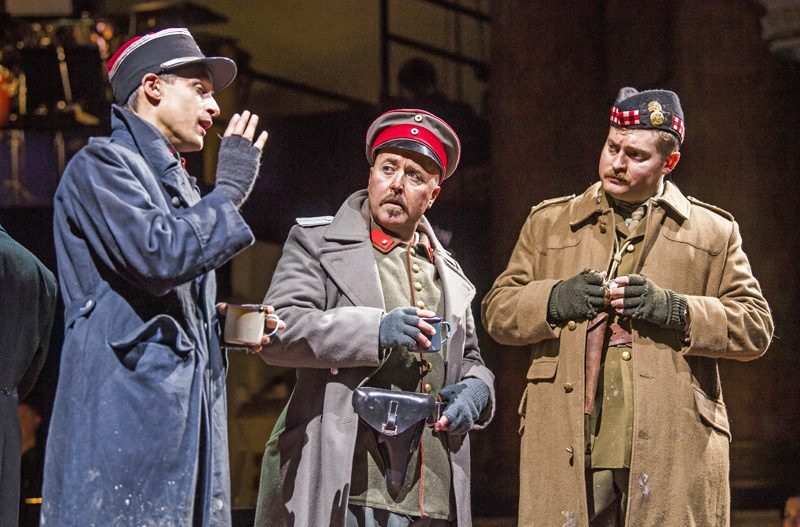 He forgoes Silent Night despite the opera’s title, but offers up moments of pure lyricism, notably as three soldiers remember the extraordinary outbreak of peace amidst all the carnage. Librettist, Mark Campbell, does not shy away from the fragility of that ceasefire. It nearly breaks down a number of times, only the determination and dignity of its instigators holding things together. There are also those in whom it inspires only bitterness. Jonathan Dale, the young Scottish soldier who joins up to protect his idealistic brother and who is tormented by guilt when his brother is killed, distances himself from the camaraderie. He does not want to share his whisky with the German soldiers, he wants to kill every one of them – with his bare hands if necessary. There is foreshadowing in the punishment of the officers and men who are deemed to have ‘betrayed their country’ by fraternising with the enemy. Sent to Verdun, the Russian front and Neuve Chapelle, we know what they do not, that few of them will ever see home again. There is bitter irony in the challenge to the Jewish Lieutenant Horstmayer that his patriotism will be ill-rewarded. Campbell interweaves the soldiers’ languages (and Latin for the ‘Dona Nobis Pacem’ which marks the burial and honouring of the dead of all three nations), in counterpoint and commentary, just as Puts’ score interweaves different musical styles and instrumentation. bring depth and poignancy to their roles of lovers separated and then reunited by war. Charlesworth conveys the changes in Nikolaus after months in the trenches with subtlety, and Glavin (last seen as the eponymous Merry Widow in Opera North’s recent) is convincingly oblivious to the realities of his experiences, thinking (initially) only of their romance. Quirijn de Lang plays French Lieutenant Audebert with quiet authority, a poignant harp accompaniment woven around his letter home to his wife, which itself mingles with the list of the wounded and the dead from his division. Audebert’s counterparts in the trio of senior officers who create and prolong the truce – Richard Burkhard as Horstmayer and Timothy Nelson as Scottish Lieutenant Gordon – are just as strong. That extraordinary outbreak of peace still has power to move us. It’s not that it outweighs the images of horror, but it reminds us that there were moments of humanity and hope even amidst the carnage. As with Peter Jackson’s film, They Will Not Grow Old, Silent Night embraces both the horror and the humanity of war. This powerful and moving commemoration of that brief silence amidst the ‘monstrous anger of the guns,’ is a fine way to mark one hundred years since the Armistice. 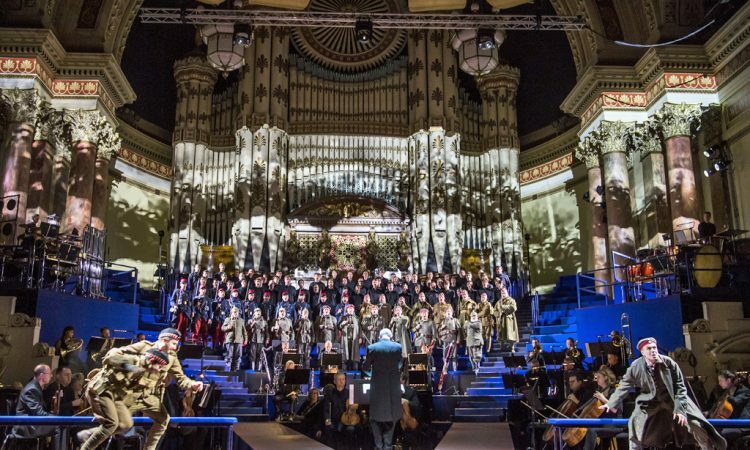 Opera North’s Silent Night is on 6th and 7th December at Leeds Town Hall. Details and tickets here.